For centuries scientists have labored to identify and reverse the cause of aging, and now that effort has converged on one gland, one hormone, and one laboratory. The gland is the pineal -- our body's natural timekeeper. 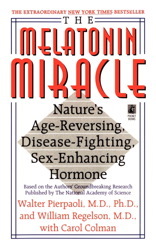 The hormone is melatonin -- the pineal's messenger. The laboratory is headed by authors Drs. Pierpaoli and Regelson -- who explain how to use melatonin to 'reset' our biological clocks in order to live longer, healthier lives. More than just a promise to look younger, The Melatonin Miracle actually tells us how to grow younger. All we need to do to turn back the hands of time is simply restore the melatonin levels of our youth. By readjusting our 'clocks,' we c an actually slow the process of aging, as well as strengthen our immune system, thereby heightening our resistance to disease and even prolonging our sexual vitality.